Leftist organization criticizes Likud Central Committee's plan to vote on applying sovereignty in Judea and Samaria. 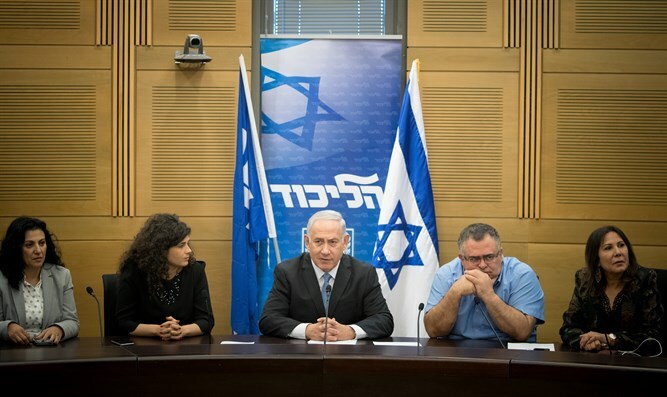 The leftist organization Peace Now on Tuesday criticized the Likud Central Committee meeting which is scheduled for Sunday, during which members will vote on a draft resolution for Israeli sovereignty in Judea, Samaria, and the Jordan Valley. "Today we found out the price tag that Bennett and his settler friends have set in exchange for their silence on corruption," said the organization. Peace Now added that "the real owners in the Likud understand that Netanyahu is weak and are forcing him to adopt the Bennett and Smotrich plan, which will lead Israel toward a binational state. This is how a Prime Minister looks at the end of his career, when he is concerned with his survival and allows this dangerous farce." This coming Sunday, the Likud Central Committee will convene to vote on a draft resolution for Israeli sovereignty in Judea, Samaria and the Jordan Valley. Earlier on Tuesday, the move was also blasted by MK Ksenia Svetlova (Zionist Union). "The idea of annexing the territories populated by millions of Palestinians is anti-Zionist and dangerous to the State of Israel," Svetlova said. "Likud leaders who want to vote for the establishment of a binational state are exploiting the weakness of a Prime Minister who is up to his neck in police investigations and is ready to do anything and even sell the country for their silence," she said. "This vote is an example of how far the Likud party has moved away from the Zionist vision of a Jewish majority, and it's unfortunate that the Likud leader is too weak to stop the madness," added MK Svetlova.